Although there are many tasks that people can DIY with ease, carpet installation is better left to the pros. If you’re shopping around for a team of experts to get the job done, you’re likely wondering what to expect for pricing. 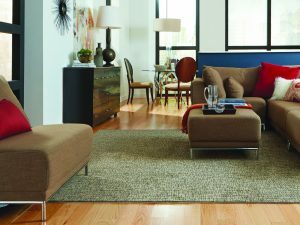 When the carpet installer provides an estimate for your new carpet, they will pay attention to the following five factors. The amount of prep work required for carpet installation varies from project to project. The condition of your subfloor will determine if it needs to be replaced, and the price can increase if your old carpet is difficult to remove. While the type of carpet material you use obviously will have the biggest impact on the overall price, the type of carpet pad the installer uses will also have an effect. Some types of inexpensive pads are fit for areas of your home people don’t use often, but other costlier pad types are ideal for homes with dogs or high traffic areas. Carpet installation in a rectangular room will always cost less than a room with oddly-shaped corners or round edges. In addition, having to work around structures such as support poles will also bring up the price. Laying down carpets on stairways requires precise cutting and labor to do. You can expect to pay significantly more if you are replacing the carpet on the stairs. Since it requires less time and effort to install carpet in one large room compared to several smaller rooms, the number of rooms receiving new carpets will affect the overall price. Although carpet installation can quickly get pricey depending on the shape and layout of your home, it is always the best option to have the professionals get the job done correctly the first time. It is important to consider these five factors when estimating how much this service will cost.